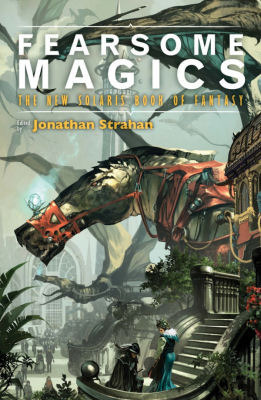 Fearsome Magics is the follow-up anthology to Jonathan Strahan’s Fearsome Journeys. Here fourteen tales set out to explore the essential element of all fantasy: MAGIC! There are novellas looking at magic in other worlds, magic in the form of mathematical formulas, magic letters, magic superstitions, and even magic chairs. And while there were a few stories that seemed a bit out of place in the anthology, Mr. Strahan generally did a great job of putting together an entertaining anthology, but like every reader, I had my favorites — some that entertained me, some that touched me, some that horrified me, and some that just made me think. “Home is the Haunter” by Garth Nix is a story that entertained me. The focus here is on Sir Hereward and his magical puppet Master Fitz. These two have been ordered by their liege lord to transport a huge cannon to an allied kingdom by the (supposedly) shorter route of crossing an endless steppes-like plain. Naturally, though, things go awry when they stumble upon a strange tower set beside a shallow sea and discover that they are now the intended victims for a ghostly goddess called the Hag of the Shallows. The tale that follows has lots of world building and spends a great deal of time fleshing out our two protagonists. Sure it could have been more focused, but other than that, “Home of the Haunter” was a fairly entertaining tale. “Grigori’s Solution” by Isobelle Carmody was a story that touched me. Here an old academic is watching a late night American program when he realizes that the end of the world is announced. As the story progresses, Ms. Carmody deftly crafts a tale where a mathematical equation sets about the end of the universe and explores how a math deficient population would be slow to understand the significance of it all before finally giving into their grief and abandoning civilization and its social norms. Great idea coupled with some excellent writing. “The Changeling” by James Bradley was a tale that horrified me, not in abject terror but rather in the terrible choices people will make. Here Hannah O’Rourke goes against her family’s wishes and marries the man she loves. When he dies, she finds herself pregnant, ostracized by her family, and her happy life at an end. After her son Connor is born and becomes a strange, almost ethereal creature, the superstition of the village witch and Hannah’s own desire for a better life drives her to a choice that no mother wishes to make. This is definitely a dark tale with a strong horror influence. “Safe House” by K.J. Parker was a tale that made me think. Here an unlucky wizard is sent to a neighboring country to locate and rescue an untrained magic user. The reason he is selected for the job is that he is more gifted at dying and then magically reforming his body after the locals inevitable catch him, torture him, and execute him as a heretic wizard. The story makes one think about magic, the death of mages, and even has a twisted ending that is a bit humorous. Overall, Fearsome Magics was an entertaining read. Sure, there were a few stories that I personally could not get interested in. And yes, there were a number of them that did not seem to really explore the central idea of the anthology. But there were also several that I really enjoyed for different reasons. So pick it and give it a try. I’m sure, there is something in this book you will enjoy reading and thinking about. This entry was posted in 3 Stars, Anthology, Fantasy, High and tagged Christopher Rowe, Ellen Klages, fantasy short story anthology, Fearsome Magics, Frances Hardinge, Garth Nix, Genevieve Valentine, Isobelle Carmody, James Bradley, Jonathan Strahan, Justina Robson, K.J. Parker, Kaaron Warren, Karin Tidbeck, Nina Kiriki Hoffman, Robert Shearman, Tony Ballantyne. Bookmark the permalink.